First things first – timeshare, or vacation ownership as it is sometimes called, is nothing more than the difference between renting your vacation accommodations, such as a hotel or motel; and owning your vacation accommodations. And while you can of course return to your home resort every year, timeshares offer you upwards of 6,000 resorts worldwide that you can trade into. While that seems straightforward enough, the various forms of ownership and how to use those products can be confusing. A “fixed week” of timeshare is exactly what it sounds like. You own the rights for a specific week of the year, in a specific room size at a specific resort, which can be traded for another timeshare for a fee. A “floating week” gives you the rights for a non-specified week of the year at a specific resort, in a specific room size, which can again, be traded for a fee. The majority of timeshare resorts in the Orlando area now operate on a “point-based” system. This gives you more flexibility; you are not held to any specific timeframe or any specific room size. Using points effectively can be confusing and all points are not the same; Disney Vacation Club points for instance have no relation to Orange Lake Resort and Country Club points. There are more than 100 timeshare or vacation ownership resorts in the Orlando area. Very few of these resorts are straightforward enough to even use the word “timeshare” in their name, preferring instead to simply call themselves a “resort.” Why? Simple. Timeshare has a well-earned bad reputation. Going back 15 years or more, timeshare was, at best, a sleazy endeavor and at worst, an outright scam. Although the industry has made taken some significant positive strides and Florida in particular has initiated some stringent consumer protection measures, many consumers still “head for the hills” when they hear the word timeshare. Combine that with the myriad of offers visitors to our area are accosted with at every turn; “FREE TICKETS,” “DISCOUNTED DINNER SHOW TICKETS,” “DISNEY TICKETS ONLY $10” and it is no wonder that while more than 3 million Americans are lured in by one of these offers, the vast majority of them walk out more confused and annoyed than when they walked in. Any significantly discounted or free tickets you are offered will require you to attend a timeshare sales presentation. Legitimate discounted offers do exist. The American Automobile Association (AAA), AARP and various hotel or airline loyalty programs are some of the legitimate providers of discounts. 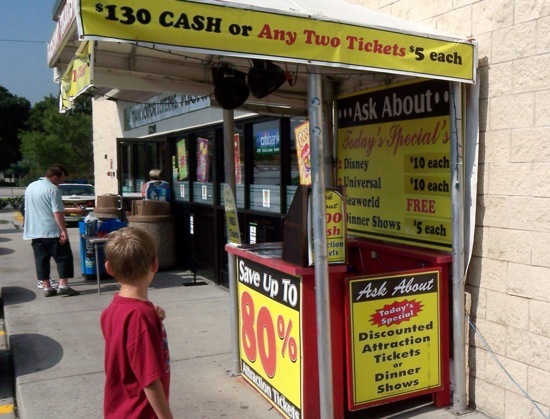 But when the discount or free tickets come from a booth set up on the side of Highway 192, or a guy coming up to you at the Denny’s on International Drive, you can be assured that you will be required to attend a sometimes lengthy, sometimes high-pressure sales presentation in order to obtain these tickets. Timeshare sales presentations rarely last the 90 minutes that you are often promised. As a former timeshare salesperson, I can tell you they generally last a minimum of two hours. Factor in the travel time to and from the resort and the “wasted” time you’ll spend eating the included breakfast or lunch and you’re talking a minimum of four to five hours out of your day. Remember that you are in control at all times, despite what the salesperson and/or sales manager would like you to believe. This does not give you carte blanche to act in a disrespectful manner, but you, the consumer has the power. If, at the end of the presentation they won’t take “no” for an answer, get up and ask to speak with the project director, not the sales manager. The sales staff are interested in the sale; the project director is interested in keeping people happy. The average price of a two-bedroom timeshare last year was $16,000. If the resort is asking for anything substantially more or less than that, you should be asking why. Don’t fall for “mysterious math.” As you know, hotel rates do not increase 15 percent every year, so don’t let the salesperson tell you that. And don’t let the salesperson dismiss the annual fees that a timeshare comes with. There is no such thing as the “best” timeshare. Different people have different needs. You need to know what your vacation likes and dislikes are. Do you like to plan ahead, or are you more spontaneous? Stay away from anyone, particularly a timeshare salesperson who uses one or more of these words: “free”, “perfect”, “always” and/or “never”. Free and perfect simply don’t exist and always and never are very, very long times. Almost everything is negotiable. If you don’t ask, you don’t get. That goes from the price, the membership dues and especially the financing rates. Although the vast majority of timeshares sold in the United States are based in real estate, do not think of it as a traditional real-estate investment. It is not going to go up in value. But then again, what is happening to the value of your hotel receipts? Timeshare has come a long way from the day when sleazy developers were selling unknowing consumers swampland. Today there are more than 5,800 resorts worldwide and the number of brand names, such as Disney, Marriott and Hilton bring new choices for owners and go a long way to legitimize the entire industry. Taking timeshare presentations in Orlando can sometimes give you a warped view of timeshares. Large blocks of buildings full of condos near golf courses, overlooking parking lots or highways. And yes, while the timeshare world is full of those types of accommodations, there are also thatched roofed cottages in Belize, golf resorts in China, country clubs in England and garden villas in Italy. While timeshare developers want us all to believe the only way to buy a timeshare is to sit through a lengthy presentation at the resort, consumers have more choices than ever. Of course, you can take advantage of the ubiquitous discount offers that are out there and listen to the sales pitch. You are also free to walk into any timeshare resort and ask to see the property and the price. It’s a great way to see what the resort offers especially if you plan on using your home resort more than exchanging it for other places. Resale timeshare can be huge cost savings; prices are typically 60 percent less than buying from the developer. However, buying resale warrants far more knowledge than buying from the developer. Just because the timeshare is being sold for $2,000 doesn’t make it a good deal! Just as most people hire a real estate agent to guide them through the pitfalls and advantages of a real estate purchase, savvy consumers can hire a professional, experienced timeshare consultant to guide them through the murky timeshare waters. • Lisa Ann Schreier may be contacted at lisa@timeshareinsights.com. She is the founder of Timeshare Insights, a consumer consulting service. She is also the author of both Surviving A Timeshare Presentation…. Confessions From The Sales Table and Timeshare Vacations For Dummies. Lisa also speaks to consumer groups around the country. This is one of the best articles about what to look out for in buying a timeshare that I’ve ever read. Thank you for printing it. After watching some friends have a great experience buying a timeshare through redweek.com, we followed suit and it turned out really good for us, too. Ms. Schreier’s suggestion of using a consultant is right on, and our recommendation is redweek.com.